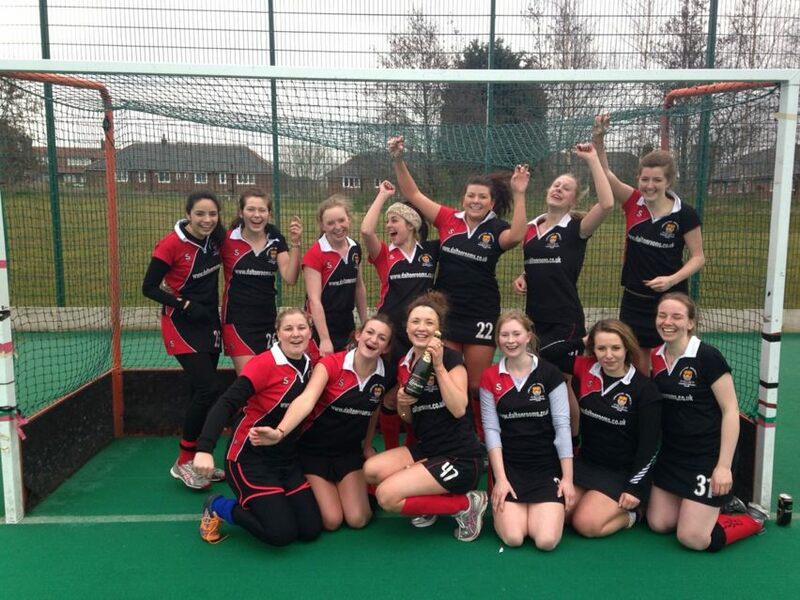 The Women’s Hockey Club 2nds celebrate last season’s title win. Like all of the university’s sports teams, the women’s hockey club is looking to have a successful 2013/14 season and build on past achievements. In total the club fields three women’s sides that each compete in the BUCS league and cup competitions, as well as the annual Roses tournament. In the coming academic year, the 1sts will take part in the Northern 2A league after finishing 4th in the 2012/13 season under the captaincy of Kate Sutton. Tandi Eser-Ruperti takes on the leadership role for the women’s 1sts this season as the side looks to improve on last year’s final standing and “push for promotion”. After winning their first match of 2013/14 5-3 away to Bangor University, who Eser-Ruperti cited as being “probably our strongest rivals” alongside Liverpool John Moores University, things look promising for the side. Though it would be difficult to predict how the table will look come the end of the season, hopes are high ahead of forthcoming games. Aside from the league and cup campaigns though, Eser-Ruperti stressed the importance of the Roses event next May which the Lancaster teams will “hopefully be able to win… especially because it’s the 50th anniversary and we’re at home”. The tournament’s significance has only grown over time and with next year’s event marking five decades of the contest, Eser-Ruperti clearly sees the prospect of captaining a victorious Roses hockey side as something to relish. Meanwhile, the women’s 2nd team will be hoping for another successful campaign having been promoted from the Northern 5A league after finishing the season as winners ahead of Liverpool Hope University’s 1st team. Last season’s captain Lauren Chester, has been succeeded by Jenna Wilks, who’ll be hoping that the team can push on for further honours this year. With the University of Cumbria’s 1sts competing in the Northern 4A league as well, the players have at least two clashes to look forward to against their closest geographical rivals this season. Elsewhere in the league, Edge Hill University’s 1sts look like another side that could provide a stern test having finished the 2012/13 campaign in second position and have already begun the new season with a 3-0 victory. Like the club’s 1sts, the university’s 2nds also competed in last year’s Roses competition which was held in York. Lara Ranger commented on the experience and summed up the team’s efforts, particularly in the indoor hockey, as valiant since the York side play that form of the game far more. As well as the 1st and 2nd sides that represent the university, the fact that there is a 3rd team squad, in both the men’s and women’s clubs, indicates that hockey is thriving in Lancaster. Women’s 3rds captain Jess Gissing is approaching the season optimistically as the side look to compete once again in the Northern 6A league in which they finished 4th last season. “I think the season has a lot of potential this year and not just for third team but the club as a whole” said Jess, who added, “we’re looking forward to all our games this year to be honest, we were unlucky last year with a lot of cancelled and postponed matches so a bit of consistency in that sense will set us on the right track.”. The team will be looking to build on an impressive opening day 4-0 demolition of The University Of Chester (Warrington) 1sts in their upcoming fixtures and with a “great influx of fresher’s” boosting the squad’s options, hopes for the season are high. On the 7th of November 2013, the women’s 3rds face the University of Cumbria away from home in the BUCS cup competition and Gissing told SCAN, “anyone that fancies coming to support us would be greatly appreciated, as that will be a very tough game and very competitive!”. Clearly the rivalry between the two universities remains as fierce as ever and any backing from the students that the club represents will be highly valued. Evidently, the entire women’s hockey club is looking forward to what will hopefully be a successful BUCS season and victory at the 2014 Roses tournament, where the entire university will look to exert its superiority over York once again and reclaim the coveted title.